At the recent Microsoft Inspire partner conference, Microsoft announced Azure Stack is now available for order and will ship as soon as September. Azure Stack is a private cloud implementation of Microsoft’s public Azure cloud. Unlike other private cloud providers, Microsoft is offering Azure Stack as a consumption-based service, similar to its public cloud counterpart. The premise of Azure Stack is to bring the core attributes we run in the public Azure cloud, into your data center. Some customers are held back due to regulatory compliance and other technical or business reasons. 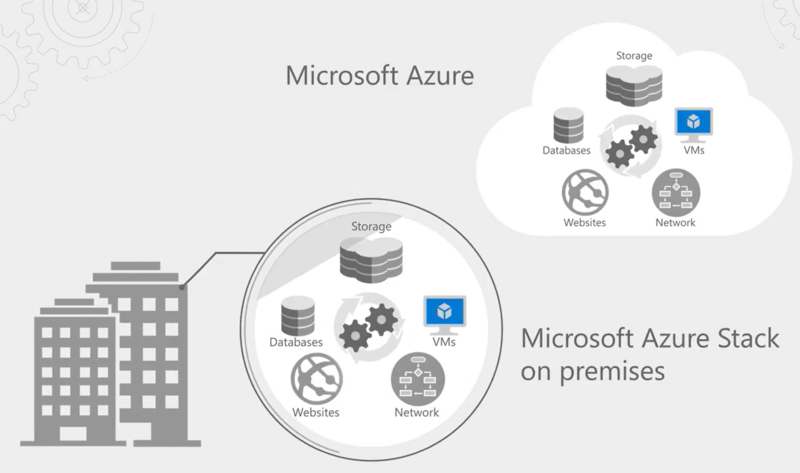 This opens up new options for you to move to the cloud, but operate Azure in your data center. The underlying hardware that will run the Azure Stack will be provided by partners. The initial hardware partners include Dell, HP and Lenovo, with Cisco joining later this year. Customers will work with hardware partners to determine the size of infrastructure required by completing a deployment worksheet with information that includes Azure Active Directory and Network settings. The hardware partner will then be able to deliver a pre-configured solution that meets the customer’s needs. Initially, a customer can start with a deployment that has between 4 and 12 scale units. It is expected that a configuration that includes 12 scale units has the capacity to run more than 400 D2 virtual machines. Each hardware partner will have different hardware and support contracts, while the Azure Stack services will be metered by Microsoft and do not require upfront costs. Administrators will have a similar portal to the one they use to manage their public cloud services. In this case, administrators will be using the Azure Stack Portal where they can provision different Azure Stack services. Azure Stack ships with a core set of foundational services including infrastructure as a service (IaaS), compute, storage (blob, table, queues) and networking. 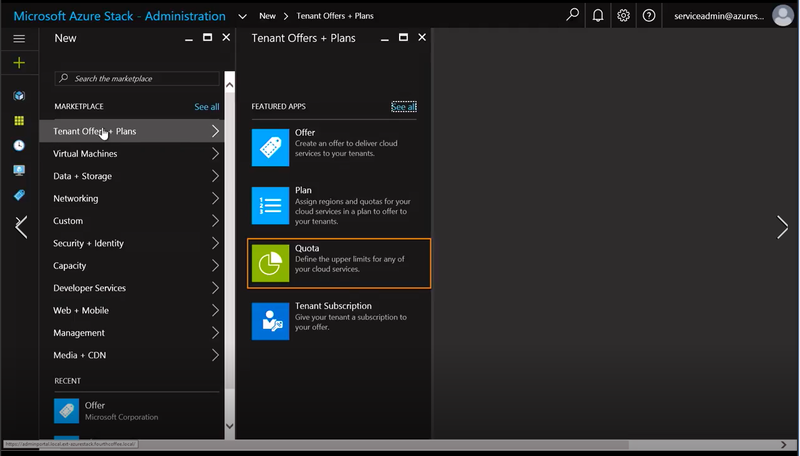 From the Azure Stack Portal, administrators can download services from the Azure Marketplace for use inside of Azure Stack. 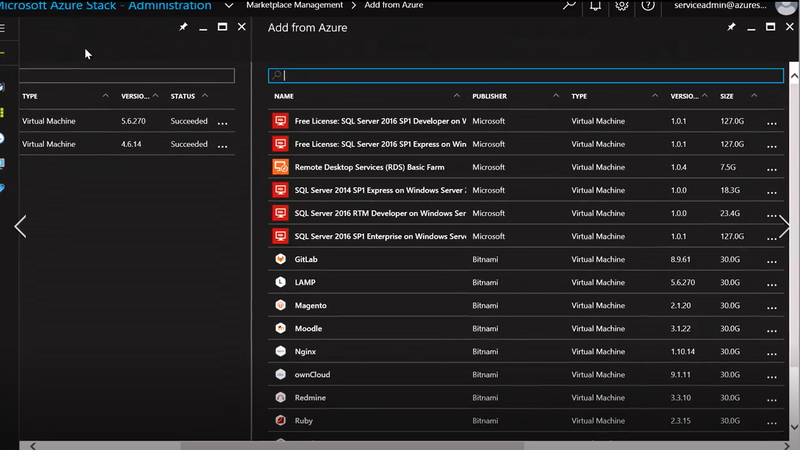 For example, if an administrator wants to make a SQL Server Virtual Machine image for use within their private cloud, they are able to download this gallery image from the public Azure Marketplace. To ensure developers do not consume more resources than they are entitled to, Administrators can configure Offers, Plans and Quotas to restrict, or govern, what services can be consumed and at what consumption levels. Using these tools, 3rd party service providers can provide their own managed, or cloud, services to multiple customers and have the ability to manage these subscriptions. 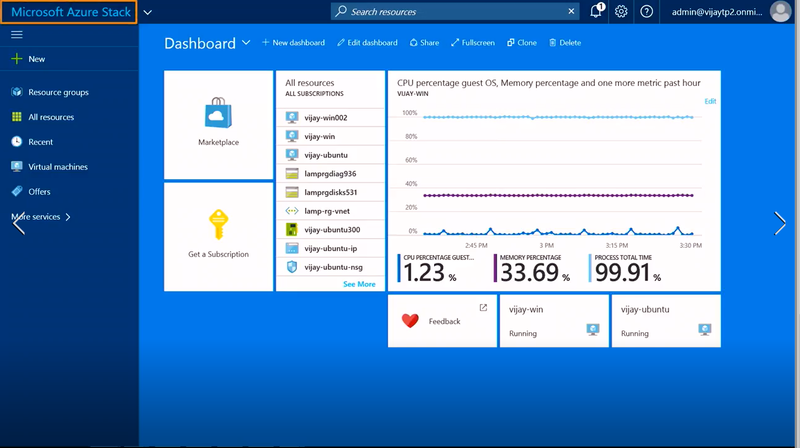 Administrators can also meter consumption through the Azure Stack Portal or through a consumption API that Microsoft provides. 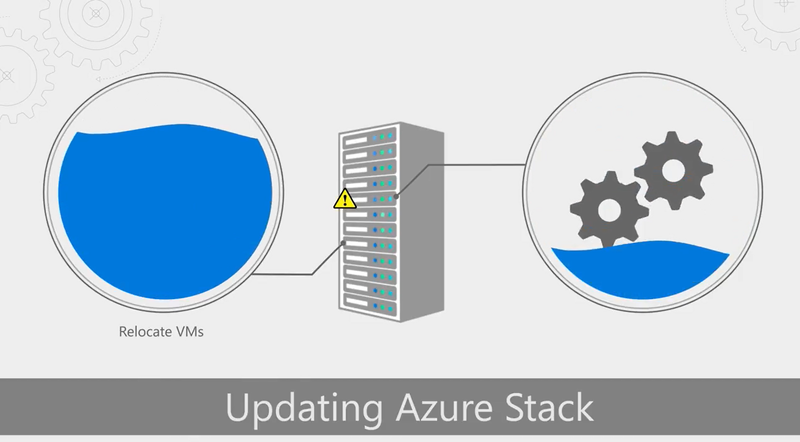 Additional management tools exist in the Azure Stack Portal, including the ability to view critical alerts and warnings. These events can also be sent to other IT management tools such as System Center Operations Manager (SCOM) or Nagios. Update notifications are also exposed on the Azure Stack Portal which may include security patches, product fixes or new capabilities. Minimal downtime is achieved during updates by draining one host and dynamically relocating these resources to a different host. Microsoft will publish updates as frequently as possible, but customers can defer for up to six months. 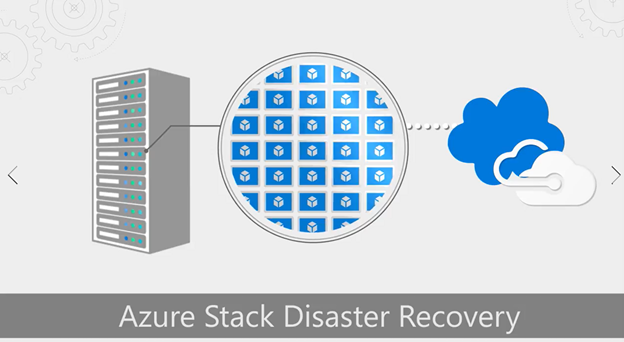 For customers who would like their primary services running on-premises, but require disaster recovery capabilities off-site, Azure Stack can replicate to the public Azure cloud. When required, customers can execute a fail-over and their services will come online in that environment. 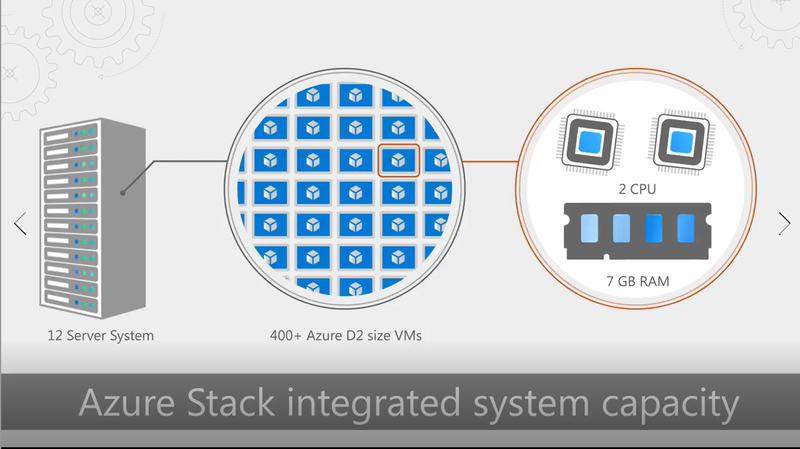 Scaling out Azure Stack, so customers can deploy to multiple regions with additional scale units. 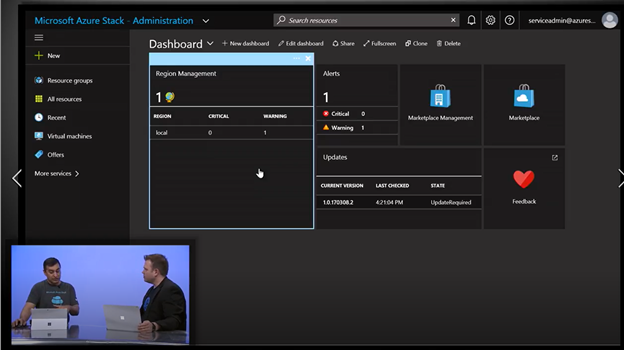 More purpose-built monitoring and alerts with integration to Azure Log Analytics and OMS. Automation of firmware updates into our patching and update framework.